I hadn't expected the Hawaiian mochi muffin at Sam's Patisserie, a newish wholesale bakery in Berkeley, to give me a bad case of homesickness. But there was no mistaking it: The mochi's crisp, sesame seed-flecked exterior and the buttery richness and chewy-sticky quality of its glutinous-rice-flour-cake interior were uncannily reminiscent of the nian gao (glutinous rice cakes) that my Chinese-Taiwanese mother would bake each year in big Pyrex baking sheets for the Lunar New Year's feast and other family celebrations. It was like taking a bite of my childhood. The mochi muffins are the handiwork of pastry chef Sam Butarbutar, who runs his wholesale bakery and pastry business from the kitchen inside Catahoula Coffee Co.'s Berkeley cafe (2080 Fourth St.). According to Butarbutar, the muffin's nostalgic quality is no coincidence. When he bites into one, he gets flashbacks to his own childhood in Indonesia, where mochi is a popular snack, and whose native flavors he infuses into each of the muffins: palm sugar, coconut milk, and pandan — the grassy herb that gives the waffles sold at Vietnamese banh mi shops their distinctive green hue. Butarbutar says he never intended for his baked mochi to become the centerpiece of his business. The self-taught pastry chef explained that his broader interest lies in making traditional French pastries — croissants, tarts, and so forth — with Asian flavors. But during the earliest days of his business, when Butarbutar was still just baking in his home kitchen, he kept getting requests for gluten-free baked goods. He knew other pastry chefs would simply substitute tapioca or rice flour in place of wheat flour, but he felt that most of those recipes didn't take advantage of the particular characteristics of rice — its ability to create a texture that is both crispy and chewy at the same time. "I thought, why not make something that's more rooted in some kind of tradition?" Butarbutar said. That's when he starting experimenting with mochi, starting with the more typical steamed varieties. The recipe he eventually settled on was inspired by butter mochi, a kind of baked mochi that he remembered eating during a trip to Hawaii. 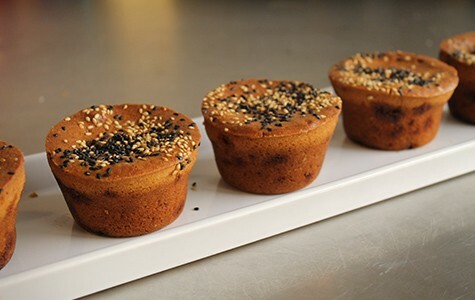 They are "muffins," insofar as their shape is concerned — but really it's mochi batter that he bakes in muffin tins to yield convenient, individual-serving portions. 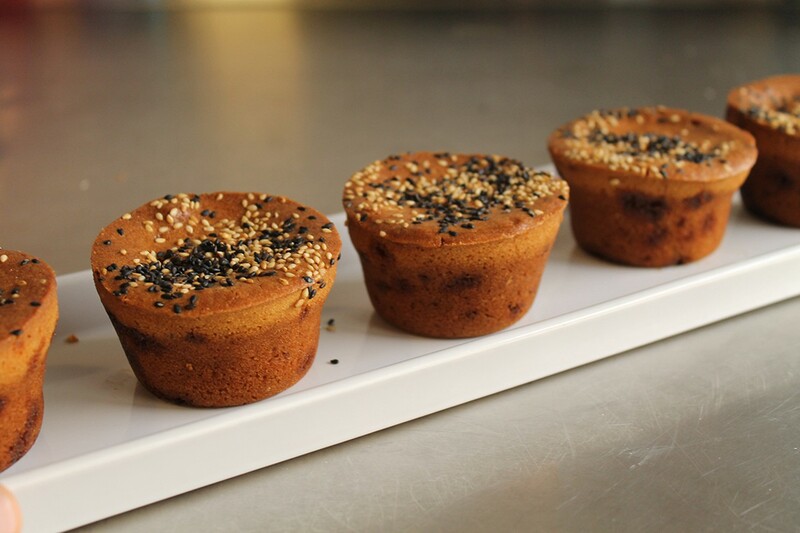 The mochi muffin quickly became far and away Butarbutar's most popular item. The Sam's Patisserie mochi muffins have more toffee-butteriness than my mother's nian gao (which also had a red bean paste filling that Butarbutar omits) and a crunchier outer surface — a quality he decided to accentuate after he accidentally overbaked one of his early experimental batches: "It was a very happy accident." In many ways, Butarbutar's entire professional cooking career has been propelled by a similar series of fortuitous accidents, starting with his inability to find a job after graduating from UC Berkeley with a degree in toxicology. That led him to take his first part-time gig as a line cook at a restaurant in San Luis Obispo and, soon after that, he landed a job as a cook at Lazy Bear, back when David Barzelay's ambitious San Francisco supper club was still in its underground pop-up phase. But baking was always his first love, and so two years ago he launched Sam's — first as a cottage food business, and now as what is primarily a wholesale operation. In terms of next steps for growing his business, Butarbutar said he wants to focus on doing more catering and special events — Oakland's recent Eat Real Festival was his highest-profile gig to date. But he also hasn't given up on the dream of having a whole line of Asian-inspired French pastries that go well beyond his signature mochi. Eventually, he'd like to have a brick-and-mortar bakery of his own somewhere in Berkeley. For now, you can find the mochi muffins at a handful of East Bay restaurants and cafes — Open Cafe in Oakland; Bartavelle, Asha Teahouse, 900 Grayson, and Alchemy Collective Cafe in Berkeley; and both Catahoula Coffee locations (in Berkeley and Richmond). At the Fourth St. coffee shop, you'll also find a wider selection of Butarbutar's baked goods, which often include scones and almond cakes.